Ok, I'm doing a shameless plug. But it's only because I've used this book and it is in my opinion, and that of a great many sailors I've met, the best one out there today. Shawn and Heather not only cover some great hikes plus snorkel and dive spots but they also give you their favorite waypoints for the anchorages. ( I"ll bet they're thinking twice about that one) I only hope they keep making more guides for more areas. It's really refreshing to find a book that covers more then just the anchorages. The New Guide Book is Here! The New Guide Book is here! And is it ever, this New Edition is Awesome! I thought the 1st one was the best guide book ever, but this one goes beyond the 1st book. Shawn and Heather have out-done themselves. There's more info, more waypoints, more anchorages and the aerial photography is phenomenal. It gives you a really good idea of what everything looks like. Once again bravo to Shawn and Heather for improving upon an already outstanding guide book. Well they've done it again! Shawn and Heather now have a guide book for the Pacific Mainland Mexico. They show you everything you need to know to have a safe and accurate journey from Mazatlan to Zihuatanejo. They've even corrected some of the old charts so you won't end up sailing 2 miles in on some dirt road or anchor in someone's yard. These two have made the most comprehensive up to date guide books that exist with plenty of information and color aerial shots. 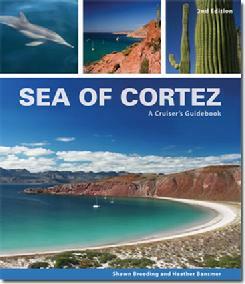 These are the best guide books out there whether your cruising the the Baja side or the Mainland these are the only books you'll need.